The rings in the photos are sold, and are shown for inspiration. The second photo shows a three ring stacking set, in 14k white gold. 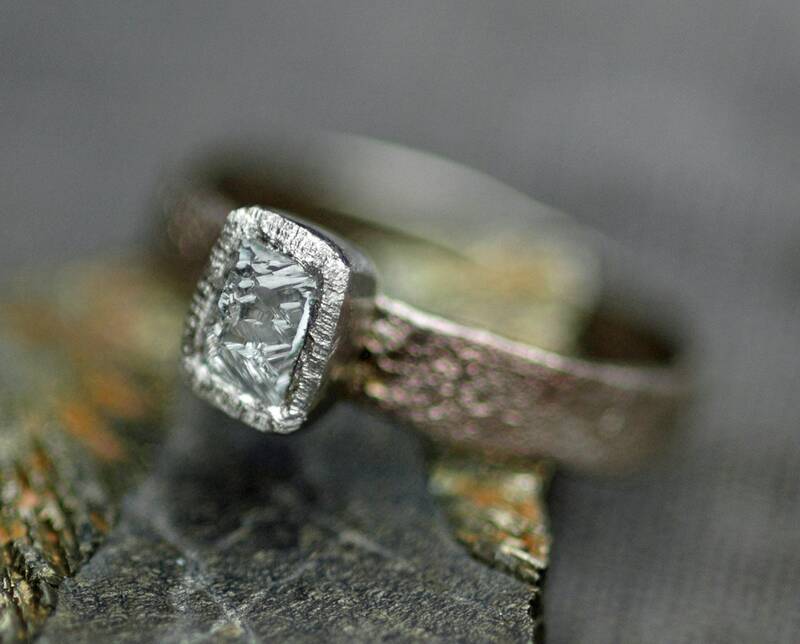 The first and third photos are a reticulated white gold diamond ring- please note that this band is slightly wider than the one you are buying in this listing. 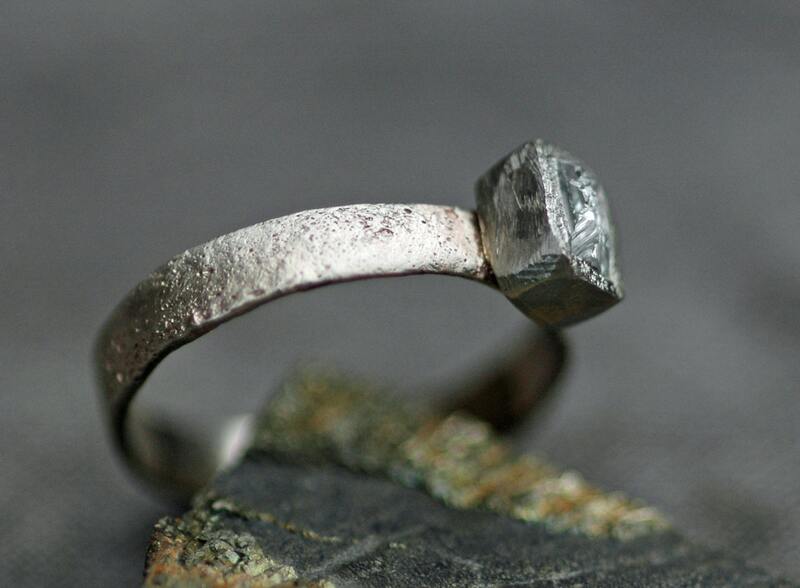 This listing is for one of the sawn diamonds shown in the final photo, set onto the gold ring of your choice. The ring band is 2 x 1mm, is flat/rectangular profile, and can be either 14k or 18k gold. 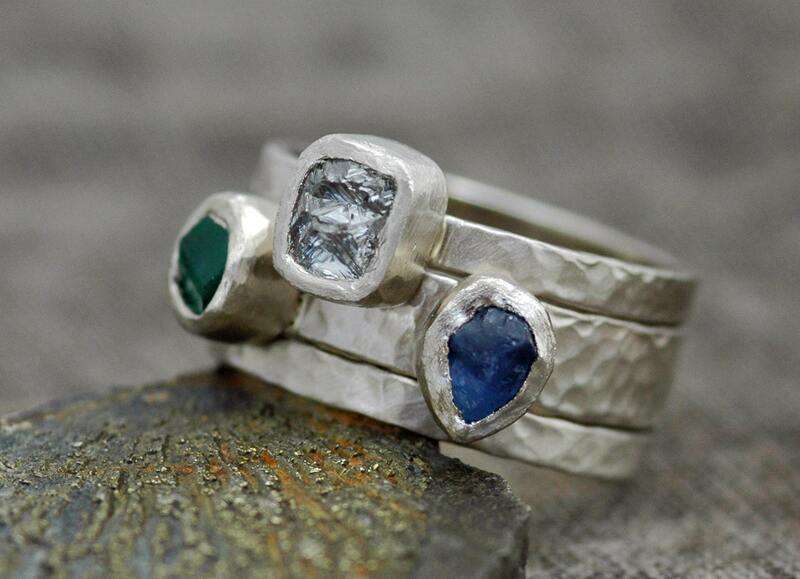 All of my rings are designed and hand-forged by me in my studio, and are constructed of fully recycled gold. If you wish to have a wider band, or a half-round/domed profile band, please get in touch for an estimate. With this listing, you may choose the texture for your band- the most popular are hammered, brushed/matte, and high shine. If you wish to have your band reticulated, please contact me for information on this process, and the cost. These diamonds are known as sawn. 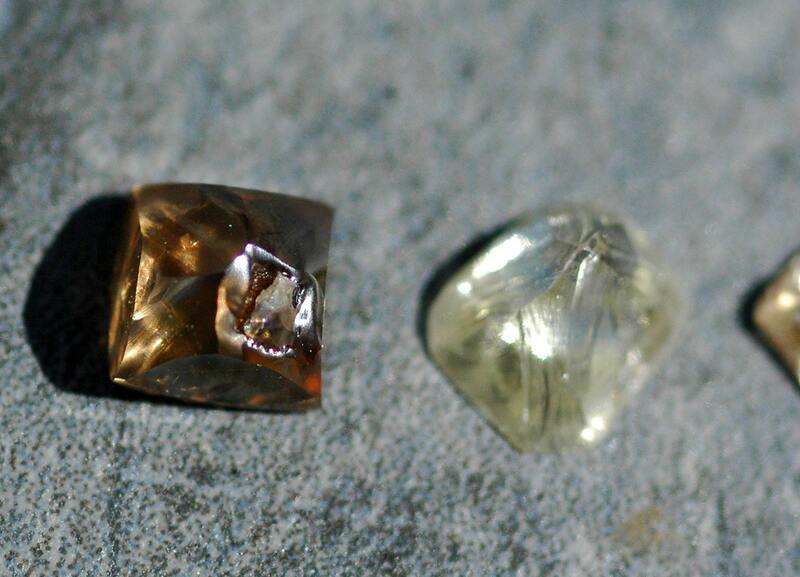 The raw diamond crystal is bisected, leaving a smooth bottom. The top of the stone is left in its original, raw form. These diamonds are wonderful for bezel setting. If you wish to have your diamond prong set, please get in touch. Prong sets will need eight prongs to hold the diamond in place properly, and incur an extra cost. I recommend bezel setting as the ideal way to set these diamonds. My current parcel of sawn diamonds are Australian- they were sourced from the famous Argyle Mine. They are certified conflict-free. They are in the 'fancy color' range, and include cognacs and yellows. Please note that the gorgeous Stone 1, in deep cognac, has a surface fissure on its one face. I have included a close-up of this fissure in the photos. This is not a structural weakness in the stone. If you would like to see further photos of this natural formation on the stone, please get in touch.